Dental implants have managed to change dentistry forever. In the past 25 years it has become more and more advanced. Dental implants are used to be able to fill in the gaps where you are missing teeth. They are so good nowadays that it is hard to know that teeth implants are fake. Most treatments on offer today mean that there has been scientific developments, understanding; and of course extensive research behind them, before being offered in dental offices. When dental implants are suggested, your dental professional will be able to discuss the procedure with you in great detail, and let you know the ups and the downs of the procedure. However, for many the prospect of being able to have teeth back again after losing one, there are no downfalls to the treatment, and the future is bright. If you have lost a tooth and the gum is a little bit raw you will need to let your gum heal for a period of up to 6 months before opting to fit an implant or implants. Your dental professional will know what is best for you. They are made out of titanium and are bio-compatible and very strong. That means that the body will not reject the implants as a foreign object. Titanium alloys is the most common metal used in bone implants and dentistry. There is a very high success rate amongst patients that have them fitted. Titanium has the ability to be able to fuse the bone, in a process that is called osseo-integraration. When your teeth are missing, the supporting bones are lost too. By adding dental implants it helps to be able to make the bone more stable and stop the bone from being lost too. When lost teeth are replaced with dental implants they help to make the jawbone more defined and they will help to improve your quality of life. You will be able to eat, smile, talk and of course chew once again without difficulty. Here at VitaSmile we fully understand how hard it can be to face tooth loss, and we have a lot of treatments on offer to help you to be able to combat the issue. 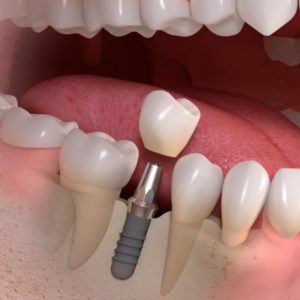 Dental implants are one, alongside dentures and bridges of the options on offer for tooth loss. It is best that you book an appointment today to chat with one of our specialised dentists about what is the best option for you in order to be able to restore your smile. Many think that the cost of implants is pricey when compared to dentures, but when you think about the benefits that they can offer that dentures and bridges cannot, you are on to a winner. If you are conscious about your smile, your gums have healed since tooth loss and you really would like the closest thing to real teeth back, then dental implants are the perfect option for you. We will be able to assess your teeth and let you know if you are a candidate for the procedure. It will be a good choice for you to make.